Silhouettes By Hand offers a range of products based around its signature offering: handmade silhouette portraits. Click on the above images to learn more about the products and to order easily through the secure e-commerce cart system. Read below the video about making your order. Mother’s Day is coming! Did you know that Mothers and Grandmothers love silhouettes? If you are thinking about making a Mail Order, get your Order in by April 29, so Lauren has time to cut and ship your order around her live public appearances and connected travel. All of Silhouettes By Hand's portraits are made in the traditional manner: by hand, with only scissors, without drawing, tracing, or any machine. 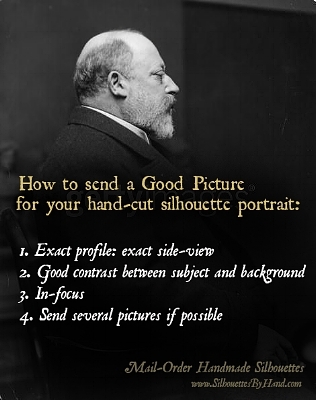 Even Mail Order portraits are made in this manner - the only difference is that instead of using a live person to portrait, a photo is used - in the same pose. All orders are received, reviewed, created, mounted, prepared for shipping, and shipped by the artist herself. Please ensure that your order is detailed (when necessary) and accurate —- so you experience the best service even during busy times. I designed Silhouettes By Hand to be a live experience of a historic, heritage, traditional service: having a portrait made before photography was invented. Little did I know that people would love silhouette even from the comfort from their own home. After I noticed that people like mail order, I created a way to order these traditional silhouettes online - directly with me. Sometimes it is easier and sometimes it is harder to cut from photographs. Your silhouettes are made in the method as shown in the video above: I look at your photos and cut as if the person is sitting with me. Your order is reviewed and handmade by me, your artist… this is a personal service. In a world of discount stores or employees or mail order, your service is being performed by hand, by the artist herself. Every effort has been taken to scrutinize your photos to represent the facial features and the beauty of your loved one. I make an effort to reproduce those facial, hair, and clothing shapes as seen in the photographs, while also being a trained, professional artist knowing human anatomy. Your resulting silhouettes are the style of the artist in the best representation of our classic silhouettes of the era 1700-1900. Please encourage your loved one to pose calmly, without making faces or smiling. I know it’s hard with young children or even pets! There are so many reason to wriggle. Try to get them to look forward while watching something in front of them, perhaps a toy or a movie. So my request to you is to make sure you send several photos exactly as described in “What to Send”, and also read the “Terms”, which contains the Policies and Notes. I will try my best to translate your three-dimensional loved one into two-dimensions: the paper. Thank you - and enjoy your silhouettes! To make an order, click on the product-photos at the top of the page - you will be able to order Silhouettes, extra copies of the Silhouettes, and Frame or Mat. All elements are completely described. It's very easy to add items to your cart, pay securely, and send your photo - often all from your smartphone or tablet device. If you have additional family members (for example 2 sets of grandparents), you can order Additional Copies ($10 each) of your original Freehand Silhouette order. The limit is 2 copies. The reason that the additional copies is limited is because no more than 4 silhouettes can be cut at one time, so an entirely new “Freehand Silhouettes” order will have to be made to accommodate additional copies. New: You can give a Gift Certificate to a family member, friend, co-worker, or other lucky person. You can choose all elements of your gift - silhouette portraits, frame, and/or mat. You make the payment and choose the person, she/he receives the gift. Details: "Gift Certificates" mean that you will supply the name, address, and email address of your lucky "giftee" - If it is your preference, Silhouettes By Hand will send an email requesting profile photos, and she/he will receive the order that you paid for, but without any fee or indication of price. You will give all this Giftee information at the end of the checkout process. During the ordering process, you will be asked to email a profile (side-facing) photo, as seen here. Please READ BELOW and look at this image of a profile photo to show you what your photo should look like. Send several profile photos if possible. The Turnaround (the time between receiving an order and shipping it out to you) varies depending on the season and the artist's schedule to receive, cut, and send out your order. The average turnaround is 4-10 days. Sometimes the wait is longer; if your frames are out of stock, and/or your artist is traveling cutting silhouettes out of state, or out of the country. If there is additional wait, you will be contacted. NO RUSH ORDERS. The shipping is currently United States Post Office (USPS), Priority Mail, insured. Every effort is taken to pack your package well for the fewest accidents by USPS service. However, USPS doesn't work for every customer. If you want a different shipper (UPS or FedEx), please email Silhouettes By Hand for a custom order - we will send via the shipper of your choice, at the going rates for that shipping service. Silhouette portraits are stunning when framed. This is an example of mirror copy of the above silhouette portrait. With every order you get two (2) silhouette portraits (more copies available for a slight extra fee) . And look at this stunning frame - this frame is also available as an option. The order form allows shipping to a Shipping address other than the Customer (orderer's) address. If you are planning to send your second (or third) copies to another address outside of the Shipping address, this will incur another fee. The fee depends on what you are sending; you will receive an email with any new shipping fees. Your order will be cut after all fees are paid. This page takes Credit Card, Paypal, and Apple Pay. If you have any difficulty ordering on this page, OR would like to order BY CHECK, please email Silhouettes By Hand for a custom order experience. Please ask directly for your favorite payment form. NOTE: Click on the pictures of the products to learn about them before ordering. International shipping information was difficult to create on this order page. If you are based outside of the United States and are interested in making a silhouette order, please email Silhouettes By Hand with your order request. Sadly, shipping to countries outside of the USA will require customs forms and higher shipping fees. You are making an online order with the ease of ordering from a store or a distributor; however your order is custom handmade by a trained and experienced artist and craftsperson. Your artist takes Mail-Order seriously. Your order may have been cut several times before it arrives to you, carefully scrutinizing your photos you have provided, and turned around (completed and mailed out) as soon as possible to your artist’s busy schedule. All care and effort possible has gone into hand-making your custom order, hand-packaging your order, and shipping. All sales are final unless severe breakage has been experienced by a shipping service. If a breakage or severe damage has been found on your order due to a shipping service, your artist has the right to inspect the damage and decide any exchanges. She will talk with you about the possibilities. The better your photos, the better your silhouettes. Please read the “What to Send”, and follow these instructions. Here is why: your artist does not know what your loved one looks like unless you send the best photos. If your photo is 3/4-view, or blurry, or with mouth open, or smiling, or teeth showing, or “making a face”, your silhouettes will not look the best for your collection or for gifts. She does not know what your loved one’s hair looks like, or that the momentary scowl is not the normal facial features. Photo note: if you change your photos with a photo-enhancing program, your silhouettes may not look like the original person. There are no refunds or free recuts due to your photos. Click to see the tiny shard of paper that could be cut from a silhouette to refine a silhouette… a fraction of a millimeter could be snipped, and even smaller amounts, to show minute curves and details in your silhouettes. Your silhouettes will look like the photos, but this will be handmade; not a photographic [exact] replica of your loved one. There is no use of scanning, photography, Photoshop, lasers, or cutting machines to create your order. There will be slight differences between the photo and your silhouette. This is normal for a handmade piece, especially made with scissors, often with extra copies. 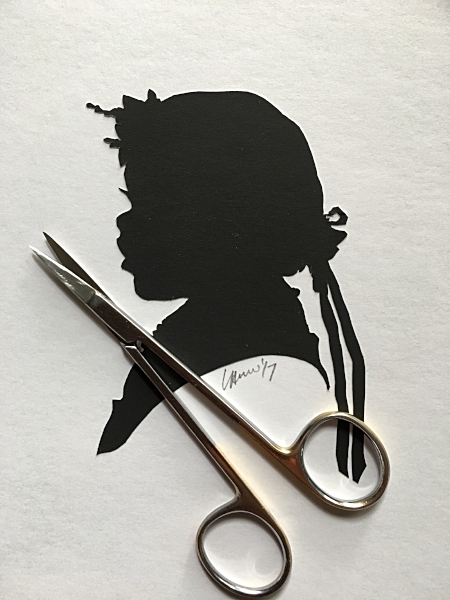 It is very difficult to cut silhouette portraits with only scissors without drawing first - in the traditional way. The amount cut and shaped could be a fraction of a millimeter (less than 1/16th of an inch - see photo at left). Your interest in silhouette might be because of the charm and the traditional imagery; your silhouettes will be a remarkable likeness - in fact, one origin of an old name of silhouettes was “A Likeness” - but they were never an exact photo-replica of a person. This is the charm of silhouettes; they are beautiful and interesting and quirky… and remarkable. However, there were never “exact”, and no handmade item will ever be exact to any photograph or person. Nature is hard to copy; nothing can ever be exact to your favorite curves of your loved one, especially little noses of tiny children. There are no refunds or recuts if your silhouettes are not an exact copy of your photograph, or of the person him/herself. Your silhouette artist has been working for over 10 years in freehand-cut silhouettes. She is self-taught from studying the historical artists from the 18th and 19th centuries. However, silhouette artists vary in style. Her work may not look like another silhouette artist’s work, and is constantly improving and evolving. Please see your artist’s style by seeing the Examples Page and her Instagram page to see her style. There are no refunds or recuts if your silhouettes do not match another artist’s style, whether from past silhouettes, or other artists you have seen live - or on the Internet. My silhouettes are generally made and mounted singly (1 silhouette per cardstock background). This is how our historical silhouettes from the 1700s and 1800s were mounted. Framed silhouettes were hung near each other, but not in the same frame..
Each order (of 2 silhouettes) will have a RIGHT- and a LEFT-facing silhouette. If you want all silhouettes facing a certain direction, please make additional orders. Details are cut when evident in the photos; such as hairstyle, length of hair, and clothing. Silhouettes will be cut as they present in the photos. However silhouettes often lack in-person detail which show age. Some silhouettes appear to be older than the sitter (for instance: babies can look like toddlers), some silhouettes appear to be younger than the sitter (for instance: older women can look in their 20’s or 30’s). This is all part of the fun and mystery of silhouettes. Silhouettes are not exact replicas of a person or a photograph. Silhouettes are made freehand with only scissors -without drawing first. That means that the scissors are trying to mimic nature’s curves and straights, often with these curves and straight in rapid succession. Photographs use differences in light and shadow to simulate nature. There is no silhouette that can ever be an exact replica of a photo, unless it was made photographically from a machine. Silhouettes By Hand uses only the hand and eye. Instagram or website examples show only those sitters and silhouettes. Silhouettes vary with the facial features of the sitter. This is normal, since every person’s features are different. Some people have rounder faces, fluffier hair, “cuter” noses, or more interesting hairstyles. Try not to compare your silhouettes to silhouettes that you have seen online or elsewhere. Your order will be sent out on schedule to reach your shipping address as per United States Post Office schedule. You will be sent tracking information. You are responsible for providing an accurate shipping address. If there is any issue with the address, the USPS delivery, or delivery schedule from USPS, your artist is NOT responsible after shipping and tracking is recorded. Your artist does not usually copy old silhouettes from your family, and definitely does not make copies of modern silhouette masters. Silhouette artists have their own style and flair, whether an artist from the past era or of the modern era. Copies of old family silhouettes are difficult, and will not be exact, and may be refused. Copying modern living artists is against your artist’s ethical values. Thank you for your interest in handmade silhouettes..